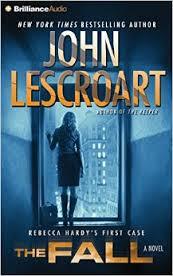 I’m a fan of Lescroart and have mostly followed the Dismas Hardy series from the first book, Dead Irish, to this one. Confessions time – I love Colacci’s reading and, except for one, have skipped the ones read by other narrators. I’ve also read a lot of Lescroart’s other series and stand-alones. The setting is always San Francisco, home to a very diverse population and generally liberal politics with plenty of murders to be solved. Hardy is a defense attorney there but has worked in other capacities. The series builds on the private life of Hardy. In The Fall Anlya Paulson, a 17-year old black woman, is thrown or has jumped off a San Francisco bridge into the traffic of the lower bridge. Greg Treadway, a school teacher and the court advisor for Anlya’s twin brother, is arrested for the murder and although he denies it adamantly he also hides some important information. Rebecca Hardy, Dismas’ daughter, (born in one of the earlier Hardy novels) and now only two years into her law career, accidentally (?) lands the case. Dad Dismas shows up regularly for his invaluable assistance and Abe Glitsky, Dismas’ good friend from police department days and a long-time character in the series, is working to convict Treadway. There are other suspects and reason to believe that the police have been hasty in their arrest, but there is also mounting evidence against Treadway. It’s a moderately complex page turner as I’ve come to expect from Lescroart.